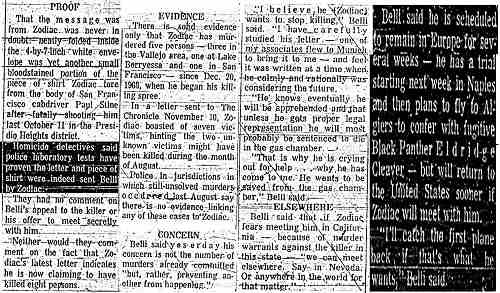 Thanks to the efforts of Zodiac author Robert Graysmith and others, media reports often erroneously state that a “lack of cooperation” somehow hindered the investigation and permitted the killer to escape justice. In interviews, Graysmith repeatedly cites this problem as one of the reasons that authorities failed to properly investigate and arrest his suspect, Arthur Leigh Allen. During his appearance on America’s Most Wanted, Graysmith told host John Walsh, “I realized the police departments in the different counties were not sharing, so, as a private citizen I realized I could go places they couldn’t and get information. It took ten years, I compiled it into a book so people could remember this case.” Graysmith apparently operated under the delusion that he had some special access denied to investigators. In truth, police were free to go virtually anywhere they pleased in search of information – including many places Graysmith could not – and, in the course of his amateur investigation, the cartoonist failed to uncover any important or relevant evidence previously unknown to the investigators. As Graysmith uttered these absurd remarks, Walsh nodded in agreement, then turned to the camera and, in a bit of understatement, said, “That book made a difference and that book is STILL helping keep this story alive.” In truth, Graysmith’s book had kept the story alive by contaminating the historical record and perpetuating myths. 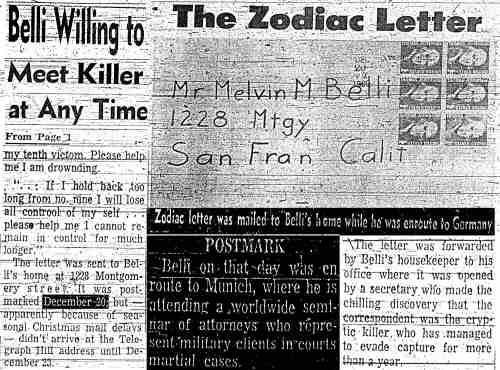 The Zodiac story was, in fact, alive and well before the publication of Graysmith’s book, and his revisionist account – which claimed the author had solved the case – did little to help the real search for the killer. 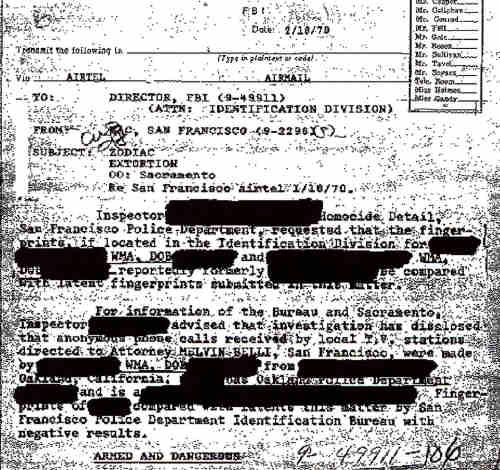 In the film ZODIAC, Graysmith’s character is given brief access to the Vallejo police reports and scours the files for information he later gives to Toschi. 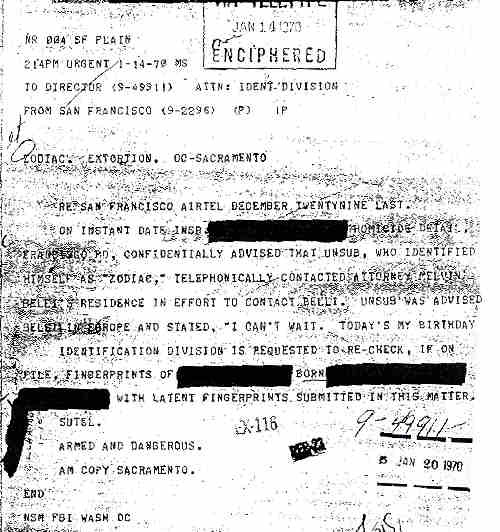 The film implies that Toschi was unable to read the files himself, when, in fact, Toschi was given a copy of the Vallejo police files and had full access to the information gathered by the various agencies involved in the investigation. 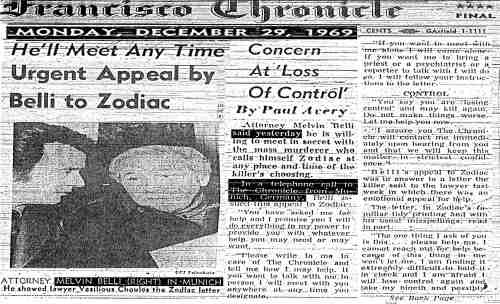 All of the available evidence indicates that the various law enforcement agencies drawn into the hunt for the Zodiac not only cooperated and shared information, but that the men and women assigned to the case acted in an appropriate and professional manner. Those who continue to claim otherwise, or claim that investigators failed to cooperate, have chosen to ignore the known facts. 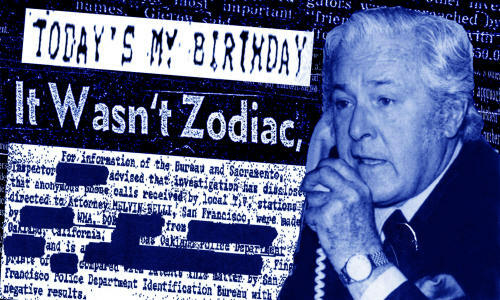 Robert Graysmith criticizes police and blames investigators for the failure to catch the Zodiac, and an ignorant media repeats his falsehoods. Unsuspecting readers of Graysmith’s books, Internet followers of the case, and others, continue to believe that police somehow botched the investigation despite the evidence to the contrary. The overwhelming majority of those involved in the actual investigations have said that virtually everyone cooperated and shared information. A few individuals have claimed that others had failed to share important information yet rarely elaborate or provide examples. The statements given by a victim can be reliable and useful, but the combination of trauma, confusion, and other factors can often hinder a victim’s ability to recall certain aspects of the event. The sound of a gunshot can be deafening, especially at close range, and the first shot can often cause a ringing in the ears of those within close proximity to the weapon as it discharges. Victims of a shooting often report that they did not hear the sound of the gun firing or that the sounds were somehow muted or muffled. These witnesses often report having heard the sounds of bullets passing by their ears and penetrating people or nearby objects. Bullets traveling close to the ear can create a sound that is similar to the sound of a silencer. Victims of rapid gunfire are often mistaken when attempting to recall the number or sequence of shots fired during a crime, and frequently provide accounts that are in conflict with the known facts. The first shot, which caused pain in Mageau’s back and neck, entered the right side of his neck just below his right ear, traveled through his jaw and exited from his left cheek. This shot was fired from a position directly behind Mageau and to his right. The shot, and the wound it instantly caused, would have been sufficient to diminish Mageau’s ability to hear. Mageau’s position inside the vehicle may have made it difficult for him to hear the shots fired outside the vehicle, especially after he moved to the back seat. The chaos and fear created by the sudden attack could have added to Mageau’s inability to recall every shot or aspect of the event. Mageau later admitted to reporters that his memory of the shooting was more an impression than an accurate account of the crime. These combined factors cast doubt on Mageau’s statements concerning a “silencer,” but the statements of one witness prove that Mageau, like so many victims traumatized by violent crime, was mistaken. A brief pause followed the first sound, and then Bryant stated he “heard what appeared to be another gunshot.” After another “short pause,” Bryant said he “heard rapid fire of what appeared to be gunshots.” He then heard the sound of a car leaving the scene at a high rate of speed. When compared with the statements given by Mageau, it seems clear that George Bryant heard the gunfire that wounded Mageau and killed Darlene Ferrin. Bryant stated that he heard gunshots at the exact time the shooting occurred. The distance between the scene of the shooting and Bryant’s bedroom window is such that he would not have been able to hear the sound of a silencer but could easily have heard the sound of a 9mm pistol firing several times, and distinguish between those sounds and the sounds of the firecrackers he had heard earlier. Bryant said that he also heard laughter at the same time he heard the firecrackers. In his interview with police, Mageau said that three cars pulled into the parking lot shortly before the shooting occurred. Mageau said he heard “some laughing and carrying on and a few firecrackers were set off” before the three vehicles drove away. George Bryant said he heard one gunshot, then, after a brief pause, he had heard another. He said this second shot was followed by another pause and then rapid gunfire. Mageau told police that he “heard a muffled sound” and then felt pain. He then “heard some more muffled sounds” and felt more pain. According to Mageau, the suspect then fired at Darlene several times, walked away, returned, and fired several more shots into the vehicle. Both Bryant and Mageau provided similar accounts: A sound, a pause, a sound, a second pause, and then several more sounds. Mageau said the sounds were muffled. Bryant said he heard what appeared to be gunshots that were louder than the same firecrackers both he and Mageau had heard. Mageau was sitting in the car with the radio playing when he was surprised, and instantly shot in the neck by a man holding a gun near Mageau’s ear. Bryant was lying on his bed in a quiet room listening to the sounds outside his window. The event left Mageau severely traumatized; Bryant calmly reported to police what he was able to remember less than 24 hours after the shooting occurred. Mageau’s wounds, the proximity of the weapon, his position in the car, the sound of the radio and the surprise element of the attack indicate that Mageau’s ability to accurately recall the shooting is less than reliable. 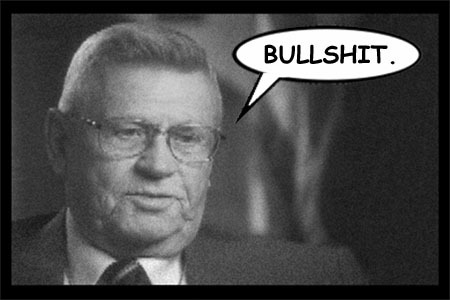 Bryant’s timing of the gunshots, the mention of laughter and fireworks before the shooting in corroboration with Mageau’s statements, the sequence of the shots, Bryant’s proximity to the shooting, his ability to distinguish between firecrackers and gunshots, and the fact that he was not directly involved in the shooting or confused at the time, indicate Bryant’s recall of the events of that night is more accurate than the account provided by Mageau. The Zodiac did not use a silencer at Lake Berryessa, despite the fact that he was committing a crime in daylight at a scene frequented by other people. It would seem unlikely that he would therefore choose to utilize a silencer while committing a crime at a quiet lovers’ lane area at midnight. 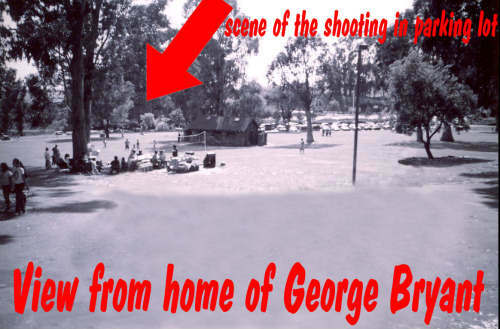 Michael Mageau’s memory of muffled sounds is understandable given the circumstances, but the statements of George Bryant and the evidence indicate that the Zodiac did not use a silencer during the shooting at Blue Rock Springs Park. Director David Fincher explained his use of a silencer in his recreation of the crime and said that the silencer was “in the police reports.” The actual reports simply repeated Mageau’s original statements that the shots sounded somehow muffled, as if the killer had used a silencer, however the same reports also stated that a witness, George Bryant had heard the shots that night. Fincher justified the use of a silencer and said that, while some witnesses had reported hearing gunshots, other witnesses had heard firecrackers which may have been mistaken for gunshots. Bryant told police that he had heard the sound of firecrackers prior the shooting, and that he then heard the sound of gun shots. With the exception of Michael Mageau, Bryant was the only witness who claimed to have heard firecrackers, and he was the only witness who said he had heard the shots. Fincher’s comments are curiously unfounded, and his attempt to justify the inclusion of the silencer may be a minor issue but serves as an example of the overall apathetic view taken when addressing the factual nature of the film.